Kangaroo rats have long tails and big hind feet with four toes. They have large heads with big eyes and small ears. They are a sandy brown color with a white underbelly. The kangaroo rat is almost perfectly adapted to life in the desert. They can survive without ever drinking any water, getting needed moisture from their seed diet. They have excellent hearing and can even detect the silent sound of an owl approaching. Their large back legs enable them to jump up to 9 feet (2.75m) in one jump in order to escape predators. Kangaroo rats inhabit a variety of desert niches. These can include open desert scrub, open grasslands, washes, sandy soils or creosote flats. Kangaroo rats are found in the drier regions of the western and southwestern U.S. The kangaroo rat is not endangered. Its status in the wild is good right now. 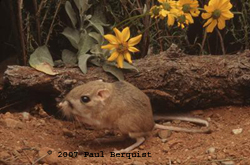 Kangaroo rats eat seeds from a variety of desert grasses as well as mesquite beans. On occasion, some kangaroo rats will eat green vegetation and some insects. Unfortunately for the kangaroo rat, it has many predators. There are many creatures out there who would like to make a tasty meal out of this small creature. Owls, snakes, bobcats, foxes, badgers, coyotes, ringtail, and your cat or dog are just a few. Kangaroo rats generally live in underground burrows which they have excavated themselves. Often times the burrow is at the base of a shrub or bush. It spends most of its day underground sleeping, and comes out to feed at night when it is cooler. The life span of a wild kangaroo rat is not very long, only 2-5 years. Depending on the subspecies, kangaroo rats can weigh up to 4.5 ounces (128 g). Their body length can be 3.5 to 5.5 inches (8 -14 cm) and their tail can be 5.5 to 6.5 inches long (14-16 cm). Kangaroo rats have pouches, but not for carrying their babies. Their pouches are on the outside of their cheeks and are used for carrying seeds back to their burrows. Kangaroo Rats don't sweat or pant like other animals to keep cool because that would cause them to lose water from their bodies. Compare with the Spinifex Hopping Mouse of the Australian Desert.